Guggenheim Hall was originally built for the study of aeronautics. 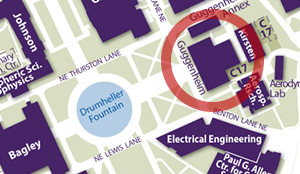 Construction was made possible by a $290,000 grant from the Guggenheim Fund for the Advancement of Aeronautics. Designed by John Graham, the facility was dedicated in April 1930, the same year the UW awarded its first degrees in aeronautical engineering. Its Gothic design incorporated several interior "state-of-the-art" features. The lectern gave faculty control over lighting and the flow of water, gas, and electricity for experiments. A new-fangled screen projector provided students the advantage of learning from educational "talkies." Since then, the field of aeronautics has changed dramatically, but Guggenheim Hall changed very little. 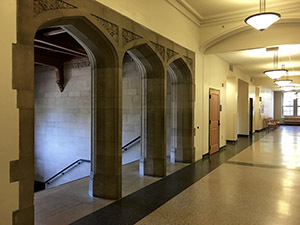 The Tudor-Gothic building went through a renovation and reopened for classes in 2007. The renovation addressed infrastructure issues in the building and included new instructional labs and classrooms.